As I mentioned last week, one of my personal spiritual goals this Lent has ben to concelebrate as many of the daily Lenten stational Masses as I can (during those weeks of Lent that I am in Rome.) The Pontifical North American College organizes an early morning English Mass at the appropriate Roman Stational Church on each of the weekdays of Lent. 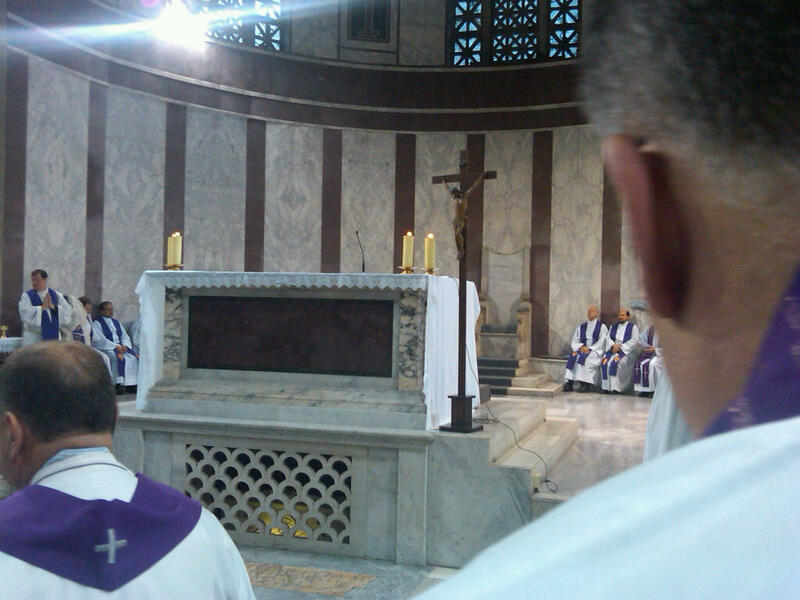 We started on Ash Wednesday at Santa Sabina on the Aventine Hill. 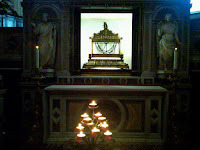 Thursday, Friday, and Saturday, the stations were S. Giorgio in Velabro, SS. Giovanni e Paolo, and S. Agostino (where St. Monica is buried). Yesterday, Monday of the 1st Week of Lent, the Station was at S. Pietro in Vincoli, a 5th century basilica, with a 15th-century façade, also known as Basilica Eudoxiana, because founded by Empress Eudoxia to house the two chains St. Peter was imprisoned with. In addition to St. Peter’s Chains, which are visible for veneration under the main altar, the Basilica is perhaps most famous for Michelangelo’s Moses. It also houses the tomb of the famous 15th-century theologican, canonist, and cardinal Nicholas of Cusa (1401-1464), author of De Docta Ignorantia (“Of Learned Ignorance”), whom I first encountered almost 40 years ago in graduate school! Like all human enterprises, however, down through the centuries Rome too has had its less edifying episodes - as well as any number of colorful historical scoundrels. Thus to reach S. Pietro in Vincoli from Via Cavour, one climbs a stone stairway, Via S. Francesco di Paola, also known as Salita dei Borgia, because it passes under an archway which was part of the house of Vannozza Cattanei, mistress of Pope Alexander VI and mother of Giovanni, Cesare, Lucrezia, and Gioffre Borgia. Giovanni Borgia, Duke of Gandia (who goes by his Spanish name Juan in the TV series), was murdered there in 1497, possibly by one of his brothers. To add to the charm of that particular place, the stairway is also the site of the ancient Vicus Sceleratus, so named because it was where the wicked Tullia (c. 535 B.C.) drove her chariot over the corpse of her father Servius Tullius (the 6th of Rome’s 7 kings) whom her husband, Tarquinius Superbus, had just overthrown! 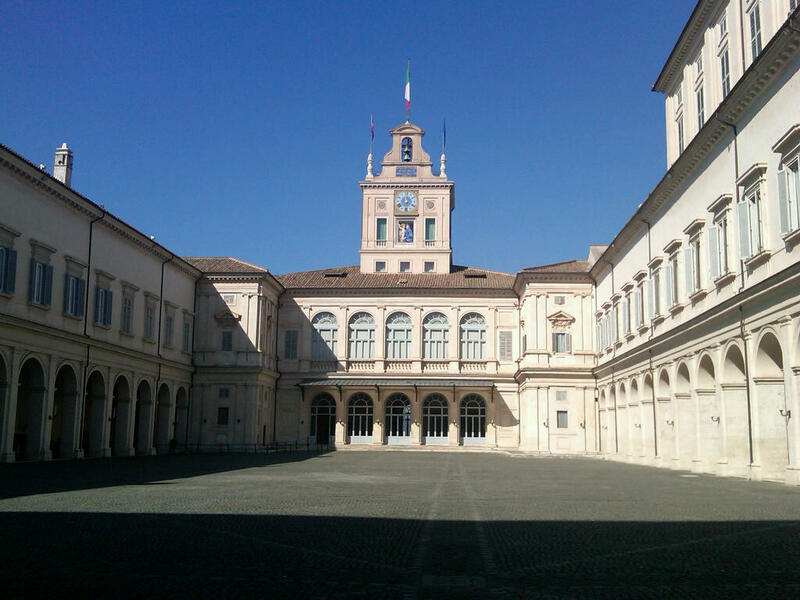 Walking past the Piazza del Quirinale yesterday, I discovered that the Quirinale Palace is open to the public for a special exhibit in honor of the last year’s 50th anniversary of Italian unification. The exhibit ends in March – as does my stay in Rome. So this morning I decided to take advantage of this unexpected opportunity to experience the inside of one of the great palaces of Europe. 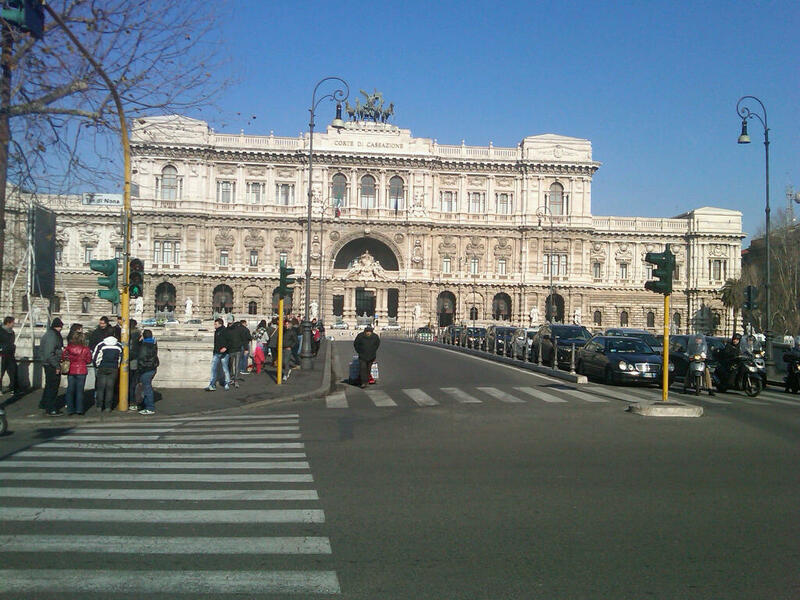 The Quirinale is the highest of Rome’s historic seven hills. Its name may be derived from a Temple of Quirinus – the name of Rome’s 1st King, Romulus, after he had been deified. Its elevated location made it a desirable site especially in summer. So a palace built there in the 16th century became the summer palace of the popes. It was the site of several conclaves, the last being that which elected Blessed Pope Pius IX in 1846. After the Italian conquest of Rome in 1870, it was confiscated from the Pope to become the principal residence of the King of Italy. From the perspective of the palace, the exhibit chronicles the reigns of Italy’s 4 kings – Vittorio Emmanuele II (1861-1878), Umberto I (1878-1900), Vittorio Emmanuele III (1900-1946), and Umberto II (1946), and their successors, the Presidents of the Italian Republic since 1946. Located in some of the palace’s elegant state rooms, the exhibit focuses on the history in which the palace has been at the center – not on the actual art and architecture of the place. 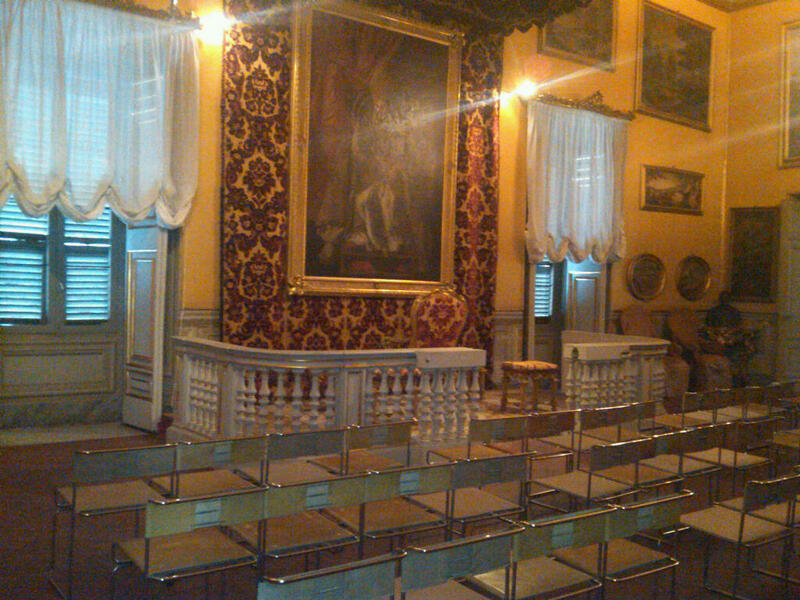 Even so, one does get to see some nice rooms, culminating in the elegant, early 18th-century Sala dei Corazzieri, from which one can at least look through the open door into the Cappella Paolina, the former Papal Chapel, which is the same size as the Vatican’s Sistine Chapel. Now used primarily for concerts, the Cappella Paolina remains a permanent reminder of the palace’s original occupants and primary purpose. Its baroque splendor recalls its origin in the post-Tridentine, Counter-Reformation era – one of the greatest periods of missionary outreach in the Church’s history. After the Italian confiscation of the palace, the chapel remained as a witness to remind its new royal residents that they were (as indeed they tragically turned out to be even in the short-term) ultimately only temporary sovereigns in this Eternal City. 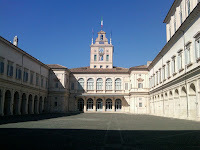 The Savoys’ post-war republican successors in the Quirinale, for all the historic splendor and symbolic resonance of their residence, have been but party politicians, presiding over an increasingly dysfunctional society still not even completely reconciled to the Savoys’ supposedly successful project of national unification. From Popes to Kings to Presidents! 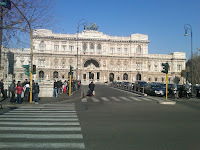 For the stately Quirinale it seems to have been a steadily downhill trajectory! By almost any measure, Ash Wednesday has to be one of the most popular days in the Catholic calendar. At my former parish in midtown Manhattan, blessed ashes are given out more or less continuously all day long, beginning at the first Mass at 6:30 in the morning. It makes one wonder: what is so special about getting dirt smudged on one’s face and being told that one is going to die that seems to be such an irresistible draw? Could it just be because it’s true! In this “information age,” we have become accustomed to receiving all sorts information which we have no real need for and derive no real benefit from. So it may be increasingly hard for us even to imagine hearing something that really matters – let alone something that matters because it is true. In a world saturated with feel-good propaganda, partisan political ads, and outright lies, we’re finally hearing something that is true. It has to be one of the great examples of the Church’s liturgical genius that it can take something so unattractive – but so true - as our inevitable return to dust, and ritualize it so popularly – and effectively – every Lent. Lent is the Church’s annual wake-up call to us to get reconnected and renewed. That’s what Lent is all about. One Ash Wednesday a few years ago, I overheard someone explaining Lent to his friend as “a time to get connected with ourselves.” Well, Lent is most certainly a time to renew ourselves. But we do that not by getting connected with ourselves, but by focusing on the big picture, and where we hope to be in that picture – and on the only one who can get us from here to there. Lent is our annual opportunity to reconnect with Christ – Christ tempted in the desert and victorious on the cross, Christ descended among the dead and risen to new life, Christ living at the right hand of his Father and forever present among us in his Church. Lent is our special time to allow him to make a real difference in our lives and to be transformed by that experience, because the kingdom of God really is at hand. because that’s what our life on earth must ultimately all about. For centuries, the Pope as Bishop of Rome regularly celebrated Mass in different Roman churches on various days of the year. These days included the Sundays of Advent, Septuagesima, and Lent, the great feasts of Christmas (3 Stations), Epiphany, Easter, Ascension, and Pentecost, the Vigils of Christmas and Pentecost, the feasts within the Christmas Octave and the days within the Octaves of Easter and Pentecost, the seasonal Ember Days, the Rogation Days, and all the weekdays of Lent. (89 Masses, if my math is correct) The Seven “Pilgrimage Churches” of Rome featured frequently among these “stations,” of course, but other churches were also included – e.g., S. Maria in Trastevere is the station for New Year’s Day. The many weekdays of Lent obviously offered an additional opportunity to include many other “ordinary’ ancient Roman churches (among them Santa Susanna, which is the stational church for the Saturday of the 3rd week of Lent). On the day of the station, the faithful once gathered in one church and walked from there in procession to the church where the Mass was to be celebrated that day. A modern version of this is observed on Ash Wednesday, when the Pope and clergy assemble at the 19th-century Benedictine Church of Sant’Anselmo, from which they go in procession to the 5th century Dominican Church of Santa Sabina, the stational church for that day. The practice died out when the Popes abandoned Rome for Avignon in the 14th century, and was never really revived. It survived in liturgical memory, however, at least until the 1969 Reform deleted the references to the stational churches from the Missal. Often the choices of prayers and readings for some of those ancient Mass texts could be explained with reference to the station. Thus, in the old Missal, the Old Testament reading for the Saturday of the 3rd week of Lent was the Book of Daniel’s story of Susanna – namesake of the day’s station. Although many of those prayers and readings have been altered and rearranged and so no longer reflect their stational origin, an indulgence is still granted to those who devoutly visit the Roman Stational Church named for that day. In recent years, there has been an adaptation of the ancient practice during Lent among some of the different language groups in Rome. Thus, the seminarians at the North American College have organized a Mass in English at that day’s ancient stational church each weekday morning of Lent. So for that part of Lent when I will still be here in Rome I hope to join this traditional Lenten pilgrimage on as many days as possible. 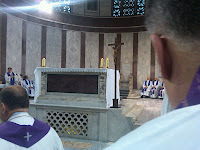 So tomorrow for Ash Wednesday, I plan to begin my 2012 Lent by concelebrating the stational Mass at Santa Sabina on the Aventine Hill at 6:45 a.m. The Consistory festivities continued this Sunday morning with a Mass at the Papal Altar in St. Peter’s, at which the new Cardinals concelebrated with the Pope. Earlier, Santa Susanna had secured tickets for me and my former Pastor from New York to serve as ministers of Holy Communion at the Papal Mass. 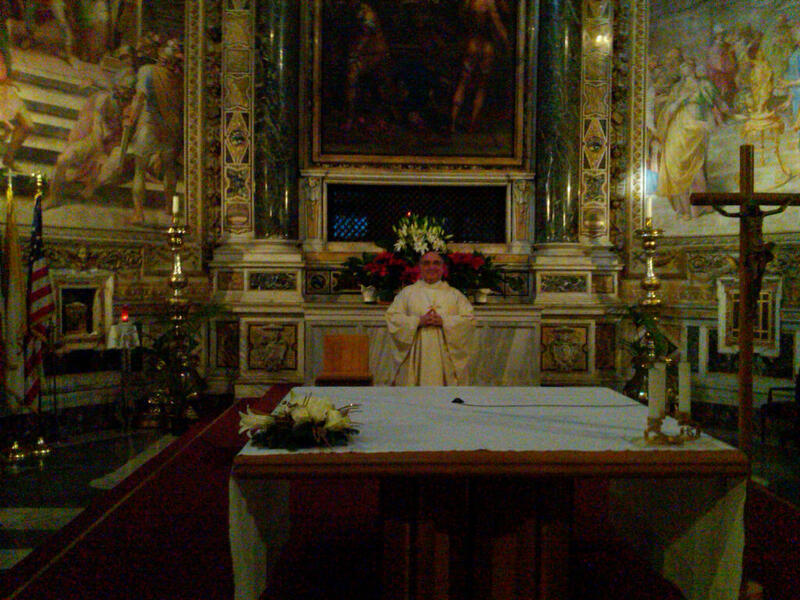 So once again – but this time in choir dress - we went very early to St. Peter’s. 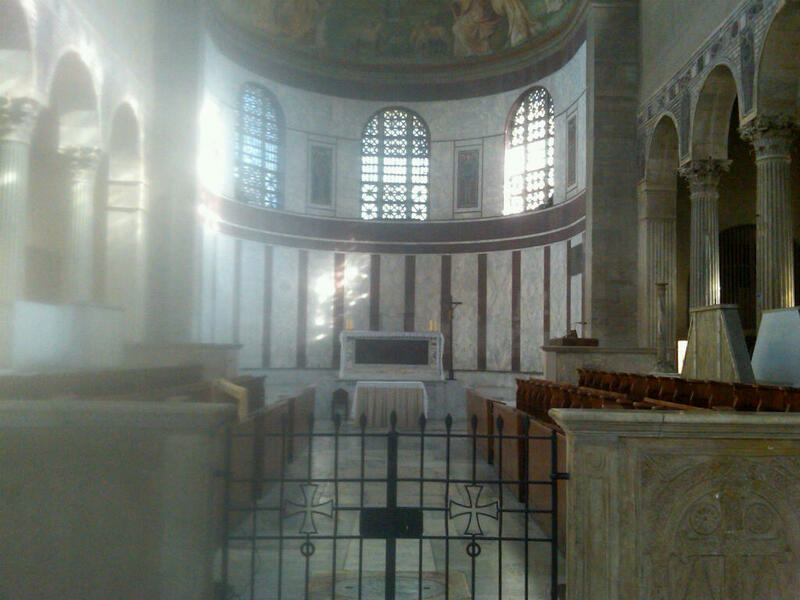 After another wait in the cold Piazza, we were admitted to the Basilica and went directly to the Chapel of the Blessed Sacrament, where we joined other priests from around the world – among them several friends from New York. 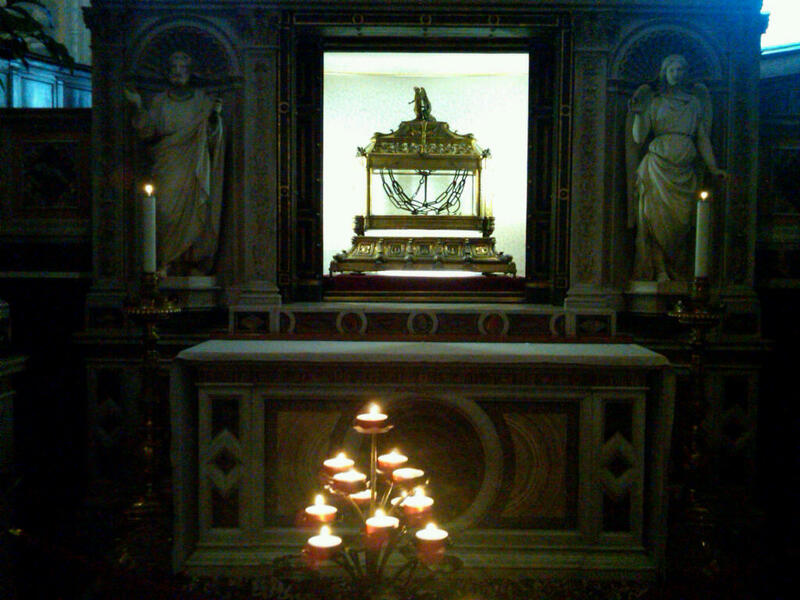 While the Rosary was being recited in the Basilica before Mass, we were taken past the Altar of the Chair (illuminated for the occasion with scores of candles) to our seats just behind the Papal Altar built above the Tomb of St. Peter. 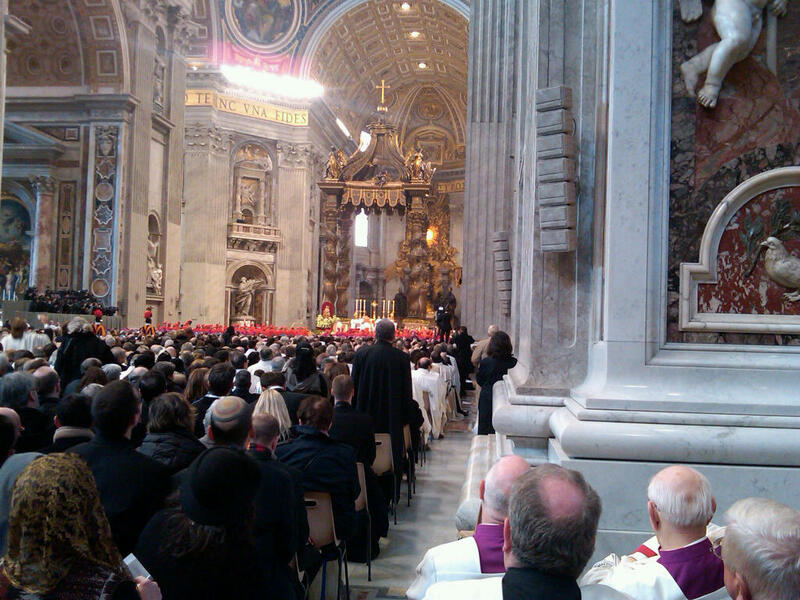 Once again, the silver trumpets sounded and the Sistine Choir chanted Tu es Petrus, as the Holy Father accompanied by the 22 new Cardinals began the Mass for the (anticipated) feast of the Chair of St. Peter (transferred in Rome this year because February 22 falls on Ash Wednesday this year). 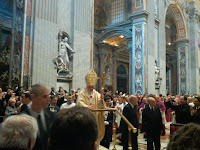 When one assists at a pontifical liturgy, it is easy to get caught up in the choreography of it all. All we ministers of Holy Communion needed to do, however, was follow a few basic instructions and otherwise go where we were told. So it was possible to enter fully in the spiritual and esthetic experience. I have to say I was really overjoyed to get to sing Credo #3 - the standard setting of the Latin chant of the Creed that we routinely used when I was growing up! 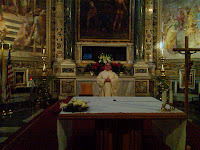 At the Preparation of the Gifts, we were each given a ciborium and took our places on either side of the altar – amazingly just a few feet from the Pope himself. Then, at Communion time, we went, each to his assigned station. After Mass, we joined the even greater throng outside in the Piazza for the Pope’s weekly Angelus message and Blessing. . The combination of the consistory and the feast of St. Peter's Chair highlighted for me the special sense of grace I always feel in St. Peter's Basilica, the sense of being at the heart of the Church.in the proximity of St Peter's tomb and in the presence of his Successor. All in all, this was certainly one of the most exciting, awe-inspiring Sundays of my entire life! This morning in St. Peter's Basilica, Pope Benedict XVI held what is officially called an “Ordinary Public Consistory for the Creation of new Cardinals and for the Vote on Several Causes of Canonization.” The 22 new Cardinals included two Americans Timothy Dolan (Archbishop of New York and current President of the U.S. Conference of Catholic Bishops) and Edwin O’Brien (Grand Master of the Equestrian Order of the Holy Sepulcher of Jerusalem, previously Archbishop of Baltimore and Archbishop for the Military Services - and like me a native of New York City’s borough of the Bronx). So, this morning, I and four fellow Paulists, along with thousands of other pilgrims, crowded into St. Peter’s Basilica. After waiting in line in the early morning chill, we were finally inside and seated, with still around an hour or so more to wait. At about 10:20, the silver trumpeters appeared on the Inner Logia above the main door and all the Basilica's lights were turned on. Finally, at precisely 10:30, the trumpets sounded, the choir intoned Tu es Petrus, and the Holy Father entered the Basilica to a great ovation. During the ceremony, after the chanting of a Gospel pericope (Mark 10:32-45), the Pope delivered his Consistorial Allocution. Then, each new Cardinal made a Profession of Faith and recited the customary cardinalatial oath: I, Cardinal of the Holy Roman Church, promise and swear, from this day forth and for as long as I live, to remain faithful to Christ and his Gospel, constantly obedient to the Holy Apostolic Roman Church, to Blessed Peter in the person of the Supreme Pontiff, and his canonically elected Successors; always to remain in communion with the Catholic Church in my words and actions; not to make known to anyone matters entrusted to me in confidence, the disclosure of which could bring damage or dishonor to Holy Church; to carry out diligently and faithfully the duties to which I am called in my service to the Church, according to with the norms laid down by law. So help me Almighty God. Each new Cardinal then received the red biretta, signifying his readiness to shed his blood for the faith, and the ring with its images of SS. Peter and Paul (based on the two statues that stand right outside in the Piazza), representing faith and missionary proclamation. Finally each one was assigned his titular church in the diocese of Rome.The Consistory concluded promptly at noon, after doing some cardinalatial business – the approval for 7 Blesseds for Canonization as Saints of the Church on October 21, 2012. Among them are two Americans: Blessed Marianne Cope and Blessed Kateri Tekawitha. After the ceremony, we headed up the Janiculum Hill (right past the Collegio Urbano where I have my classes) to the Pontifical North American College for a reception in honor of New York's Cardinal Dolan. A former parishioner I knew from St. Paul the Apostle parish in New York is now a seminarian living at the North American. Many New York priests and many Sisters and laywomen with whom I worked 20 years ago in my five years in the Superintendent of Schools Office (including my former boss, who hired me back in 1989) were there. So it was one of those rare opportunities to reconnect with significant figures from an important period in my life! Finally, later that afternoon, we returned to the Vatican for the traditional visits to the new Cardinals. We duly paid our respects to Cardinal O'Brien, then to Thomas Cardinal Collins (Archbishop of Toronto, where the Paulists also have a parish and where I was for 6 years), and of course Cardinal Dolan of NY. "He Stretched Out HIs Hand ..."
Those of us above a certain age can recall how widespread polio was just over a half-century ago. My “Baby-Boom” generational cohort can clearly remember the last of the great polio epidemics in the early 1950s – the last such epidemic, thanks to the development of the polio vaccine, which as 1st graders many of us were among the first to receive. Beforehand, however, that last epidemic induced tremendous panic. Swimming pools were closed and school openings delayed. People were terrified of this dangerous disease, which many feared might never be conquered and before whose power people felt defenseless. Recalling all that should help us appreciate the anxiety ancient people felt when faced with the mysterious disease they called leprosy. Hence, the Old Testament’s extensive instructions on how to deal with it, some of which we just heard in today’s 1st reading [Leviticus 13, 1-2, 44-46]. Generally speaking, those suffering from the disease were simply segregated by law and required to live outside inhabited communities. Also, since the disease was widely believed to be contagious, they were supposed to warn away anyone who approached them. Until 1969, the United Sates had a similar system of legally enforced segregation of lepers in Hawaii – made famous for generations of Catholic school children by the heroic story of St. Damien of Molokai, whose statue stands in the U.S. Capitol Building’s Statuary Hall. In ancient Israel, what was called leprosy was not Damien’s fatal disease but a curable skin condition. Hence the Jewish law made provision for examination by a priest and an offering on the occasion of someone’s being cured. Until one had been properly examined and certified as healed, however, a “leper” remained ritually impure. In such a world, where it was believed that only God could heal leprosy and where sickness was seen as a serious threat, the leper was shunned. Cut off from ordinary life and regular relationships with others, the leper’s lot must have been a miserable one indeed. Then suddenly, into this sad world of sickness and exclusion, appeared Jesus [Mark 1:40-45]. “If you wish!” What exactly are we to suppose that “if” meant? Did the leper doubt Jesus? And, if so, what exactly was he doubting about Jesus? Apparently, he didn’t doubt that Jesus had the power to heal him – quite amazing actually, given the general belief that only God could cure leprosy! If the leper had little or no doubt about Jesus’ power, Jesus’ ability, to heal him, however, he still seems evidently to have wondered whether Jesus would heal him, whether he would want to heal him, whether he cared enough to heal him. (Fear of germs, after all, is only one of many motives for erecting barriers between ourselves and others). Jesus understood and answered: “I do will it. Be made clean.” But, before he said that, Jesus did something even more meaningful to the leper, something so radical it implicitly violated the Law and implicated Jesus in the leper’s ritually impure status. Moved with pity, Jesus stretched out his hand, and touched him. In his desperation, the leper had boldly broken the Law and approached Jesus directly. Jesus reciprocated with a dramatic, unexpected touch, that spoke more than all the words in the world. With that one touch, Jesus united himself with the leper, dramatically ending his segregation from society. With that one powerful touch, Jesus summarized his entire mission to become one with us, and so to end our separation from God and enable us to join together in the fuller, more abundant kind of life that God wants us to live. The same Jesus, who stretched out his hand, and touched the leper, continues his healing touch here and now in the institutional and sacramental life of his body, the Church. That touch is every bit as necessary now as it was then – not just because sickness and suffering still abound in our world, but because the leper’s doubt also persists. How many of us at times really wonder whether anyone cares? How many of us at times doubt deep down whether even God cares? It is the mission and challenge of the Church – the mission and challenge therefore of every one of us – to express visibly, to embody physically, and so to become God’s healing presence and saving power present in our world, to continue Christ’s caring for us, by caring as he does. As the Law required, Jesus sent the leper to the priest to verify his healing, and to make the ritual offering in thanksgiving that the Law prescribed. Presumably, the leper went and did what was required for him to re-enter society, but the leper’s principal offering in thanksgiving was to spread the report abroad and publicize the whole matter. Whatever difficulties and doubts we may harbor, our healing will not be complete until we let Christ’s healing touch transform us, in and through our life and worship together as his Church, into agents of Christ’s caring touch to and for all the world. The lead editorial in this morning's NY Times contains the following strange statement: "Churches are given complete freedom by the Constitution to preach that birth control is immoral, but they have not been given the right to laws that would deprive their followers or employees of the right to disagree with that teaching." What law does the Times have in mind? What law - existing or proposed - "would deprive their followers or employees of the right to disagree with" the Church's teaching on the immorality of artificial contraception? There is, of course, no such law, nor is there even any law which would forbid any adult from actually using contraception. What has been at issue in recent weeks has been whether the power of the law shall be used to coerce religious instituions to pay for other people to do things a religion disagrees with, by creating a legal right to have contraception included in employer-provided health insurance. If only the Times editorial staff could get out of their ideological echo chamber long enough to grasp that simple distinction! Part of the problem, it seems to me, is the way "rights" language has been gratuitously inflated in recent decades. It may be advantageous politically to invent a new "right" whenever one wants to propose a particular policy, but it has had disastrous results for the clarity and coherence of our political and moral debates. Legal rights may either positively entitle someone to something or they may merely negatively prohibit the government from preventing something. Assuming the requisite qualifications, I have the legal right, for example, to vote and the legal right to drive a car. A year from now I will have a legal right to Medicare. These are positive legal rights created by the State entitling me to do something or receive something. But many legal rights are negative, that is, they proscribe government action leaving the citizen free as to what he or she will actually do. Thus, the constitutional rights to freedom of speech and freedom of the press prohibit the government from preventing me from freely expressing my political views. But those constitutional rights do not impose a positive obligation on the government actively to assist me to exercise those rights. Freedom of the press does not, for example, require the government to pay for me to start a newspaper or to subsidize one already in existence. When the Supreme Court invented a "right to privacy" in Griswold v. Connecticut, it struck down state laws denying married couples access to contraceptives. Eventually extended to everyone, there is, therefore, now an acknowledged constitutional right not to be prohibited from using contraception by the government. But no positive entitlement is thereby automatically created. In other words, just because the government may not prohibit someone from using contraception, it does not follow, therefore, that the government. must directly provide contraception or pay for anyone's contraceptives - let alone compel other private citizens to do so. This is one reason why I have always cringed when I hear well intentioned people talk about a putative "right to health care." I have always favored the provision of universal health care by the State - whether directly (as in Medicare) or through private insurance (as in "Obamacare"). I can easily understand why advocates of such policies would want to use whatever language advances their cause. But this constant inflation of political preferences into "rights" only leads to conceptual confusion - such as we are now seeing. By the "right to health care," those who use such language obviously do not mean that the government must be prohibited from preventing me from seeking or receiving health care. What they mean rather is that someone else - the taxpayers, insurance companies, whoever - should be compelled by the government to pay for my health care. Since, however, health care is a very expansive concept, which can expand according to different needs and desires (not to mention expensive advances in technology), the concept of some generic "right to health care" is even more imprecise in practice than it is in theory. Exactly what kinds of health care and in what amounts and at what cost are included in such a "right"? All of which then takes the discussion out of the domain of "rights" and back, where it belongs, in the domain of public policy choices to be determined, not by some a priori rights but by political deliberation and debate. Of course, the resulting policy, once enacted in legislation and regulations, creates certain legal rights. Thus, a student may acquire the legal right to remain on his or her parents' insurance until a certain age. Or someone with a pre-existing condition may acquire the legal right to be provided with insurance in spite of that fact. Or, to speak to the present issue, one may acquire a legal right to be covered by insurance which includes contraception without any co-pay. But, before any of these policy preferences become legal rights, they are first of all policy decisions, to be arrived at through the normal give-and-take of politics. They don't start out as rights, even if they may end up as legal rights. And, even then, they are not constitutional rights - let alone natural rights - but simply legal entitlements, which can always be changed by the same sort of process which created them. In this morning's New York Times, Gail Collins writes about the Catholic Church's opposition to the recently enacted mandate requiring most employers to pay for medical insurance that covers contraception: "The problem here is that they’re trying to get the government to do their work for them. They’ve lost the war at home, and they’re now demanding help from the outside." Now if that isn't a good example of getting the story backwards, what is? This isn't about the Church trying to get the government to do anything. It's about the government forcing the Church to do something. Specifically, it is about a particular political class using State power to impose its ideology on the institutions of civil society. The essence of totalitarianism lies in its elimination (or at least their disempowerment) of all subsidiary social institutions, leaving the individual dependent entirely on the State. The Founding Fathers designed a strong federal government with power to act in the national interest and a constitution adaptable to changing times and circumstances. But they also understood the totalitarian temptation and so added (admittedly as an afterthought) a Bill of Rights. The political class has gotten so used to trying to turn the 1st Amendment against religion that they may have forgotten why it was included in the constitution in the first place, which was, of course, to protect the religious freedoms of citizens from the power of the federal government. In her column, Collins makes another interesting point, however, with which I am in partial agreement. "In a sane world, the government would be running the whole health care plan, the employers would be off the hook entirely and we would not be having this fight at all. " Indeed, if only the Democrats had been willing to cooperate with President Nixon in 1973 to extend Medicare to everyone! Then we would indeed have had universal health care - and without the baggage of maintaining private insurance! Collins is wrong, however, in thinking that contraception would likely have been included in such national health care coverage. (One of the curious things about that part of the political class's cultural ideology is that, even though its moral ideas are for the most part strikingly novel, it acts as if they were self-evident universally recognizable truths that are just obvious to any normal person!). It is safe to assume, of course, that in the 1970s, the idea of including contraception would have been anything but obvious to most people. And, if the issue had actually arisen, some sort of legislative prohibition - something like the later Hyde Amendment - would almost certainly have been included. Now that it’s convenient to get around again, this morning I walked down the Via Bissolati and the Via San Basilio to Piazza Barberini, and then from there down the Via del Tritone to its end. There I visited two churches. The first, the Servite Church of S. Maria in Via, enshrines a famous Madonna found in a well by Cardinal Capocci in 1256. (One can still drink water from the well in the Madonna chapel).The second, S. Claudio in Piazza S. Silvestro was originally the national church of the Burgundians and was rebuilt in the 18th century. The Blessed Sacrament Fathers have staffed it since 1886, and the body of their founder St.Peter Julian Eymard (1811-1868) is venerated there. Since there were no political demonstrations today, after a quick cappuccino I crossed the Via del Corso to take in the Piazza Colonna, adjacent to the Italian Parliament. The column referred to is a tall Roman Victory Column in Doric style built in A.D. 193 in honor of Emperor Marcus Aurelius’ victories and modeled on Trajan’s Column. Just as Trajan’s Column is now topped by a statue of St. Peter, this one is topped by a statue of St. Paul. From there, I stopped at the Piazza di Pietra to admire what remains of the Temple dedicated to Emperior Hadrian, buit by his son, Antoninus Pius, in A.D.145. Just south from there is the Piazza S. Ignazio, where I visited the beautiful Jesuit Church of S. Ignazio and venerated the relics of St. Robert Bellarmine. Back on the Via del Corso, I visited the church of S. Marcello, built over the supposed site of the prison where Pope St. Marcellus was confined in the early 4th century. Destroyed by fire, the church was completely rebuilt in the 16th century. Its famous 14th-century wooden Crucifix, which alone survived the fire, is venerated in a chapel in the church. Finally, I crossed the Corso to the Palazzo Doria-Pamphilj, where an amazing museum housed in part of that princely Roman family’s palazzo. Among the famous members of that (originally Genoese) family was Emperor Charles V’s Admiral Andrea Doria, after whom the ill-fated Italian ocean liner was named. (The Church of S. Agnese in the Piazza Navona, which the Paulists were allowed to use as the temporary American Church while S. Susana was being repaired in the late 1980s-early 1990s, was owned by Princess Orietta Doria-Pamphilj. Her father, Prince Filippo Andrea VI Doria Pamphilj, was appointed Mayor of Rome after the city's liberation by the Allies in 1944, thanks to his strong anti-Fascist credentials). The multitude of paintings and sculptures on display in the museum – too much perhaps for the non-expert to absorb all at once - is considered the most important of the Roman patrician art collections to have survived to the present. 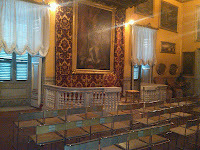 I was actually as interested in the elaborate state rooms themselves, with their furniture and family portraits. I also noticed in the Sala del Trono that the Throne was turned backwards. If my history is correct, I believe that was common among the Roman Nobility in the years after 1870, as a way of recognizing the Pope as still the legitimate sovereign of Rome, whose throne they believed had been usurped by the Italian King in the Quirinale. There are all sorts of ways one can look at the unjust HHS mandate forcing most employers to provide health insurance containing coverage for intrinsically immoral practices. Calculations about its possibly opposite effect on the “Catholic Vote,” however, may be exaggerated – or at least premature. Except in the purely demographic sense, it is not clear to me that there exists a “Catholic Vote.” I suspect that Catholics can be found at virtually every point on the political spectrum and that their voting decisions reflect the same multitude of issues that concern other Americans. It is possible, however, if this becomes widely seen as mainly an attack on the independence and integrity of Catholic social service institutions, that there will be some significant reaction among some Catholic voters, who identify with or care about the continued viability of those institutions. Certainly the sense of betrayal by the Administration felt by liberal Catholics who, so to speak, went out on a limb to support the President, particularly on Health Care Reform, has alienated that particular constituency. In a close election, any previously predictable constituency’s “enthusiasm gap” can count. But there are other – more important – lenses through which to look at this crisis. There is, for example, the moral or philosophical lens. The fundamental fact is that no one should be forced to provide or purchase health insurance that covers the procedures in question. Pregnancy is not an illness. Universal health care is greatly to be desired, but it should be about preventing and treating genuine disease – not redefining disease to reflect the anti-natalist prejudices of the cultural left. In the current ideological climate, there seems little likelihood that this argument will get much effective attention. But neither should it be left out of the discussion. The Church, after all, has a concern for the common good of society a whole. All of which brings us back to the sectarian lens that rightly looks at this issue as a matter of properly protecting the right of religious Americans to follow their consciences. If the Church cannot advance the common good of society as a whole on this issue, it can certainly try to carve out a zone of privacy within which its members can practice their religion without State intrusion – as, for example, sects such as the Quakers and the Amish have historically struggled to do. As a practical matter, given that the First Amendment is still on the books, that is the most promising avenue for litigation, which is most likely where this issue will eventually be resolved. There remains, however, also the Civil Society lens. Government is a good. A Hamiltonian at heart, I believe in strong, activist Government that articulates the values of society and marshals society’s resources to promote those values. But it is not Government’s mandate to suffocate society by displacing all non-governmental social activity and eliminating all social institutions that serve as intermediaries between the individual and the State. In this respect, the HHS regulation at issue is a direct challenge to the very existence and ideological legitimacy of non-governmental social institutions. And that is a very issue indeed. 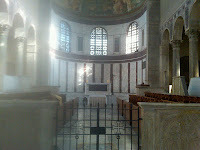 Not too far where I am living is the Papal Basilica of Saint Mary Major (Santa Maria Maggiore) on the Esquiline Hill. Originally built by Pope Liberius (352-366) and restored by Pope Sixtus III (432-440), it houses a painting of the Madonna and Child known as Salus Populi Romani, the Protectress of the People of Rome, and also the supposed relics of the original crib from Bethlehem. It is the Roman “Stational Church” for the 1st and 3rd Masses on Christmas and is where St. Ignatius Loyola celebrated his First Mass on Christmas morning 1538. It is commonly considered the most popular of the papal basilicas among Romans themselves. According to a later legend, during the pontificate of Pope Liberius, a certain Roman patrician and his wife, being childless, made a vow to donate their possessions to Our Lady. and prayed to her to make known to them how to do so. Our Lady appeared to them in a dream on the night of August 4-5 and requested that they build a church in her honor on the Esquiline hill on a spot that would be covered with snow. She also appeared to Pope Liberius in a dream that same night so that he too would see the miraculous snowfall on the site. And so, during that hot summer night, snow fell on the Esquiline Hill, tracing the form of the future basilica. Many people gathered to see the unusual event, and before the snow had melted they marked the footprint of the future basilica, which was soon quickly constructed. The legend is still recalled annually on the feast of the Basilica’s Dedication (August 5) when a shower of white rose petals falls from the Dome at the end of Mass. 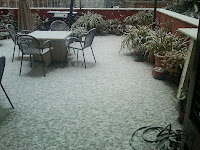 Whatever may be thought about that legend, there was nothing miraculous about today’s snowfall in Rome! It was just winter being winter – albeit more forcefully than usual. This time of year in Rome is typically cold and wet, but it has been relatively mild and dry this winter until this week. It has been cold and snowy over much of Europe these past few days. Still snowfalls are sufficiently rare in the city itself to be considered newsworthy in Rome. Where I come from, of course, this kind of weather may be more common, but it is still serious enough to be a disruption. Already last evening the Mayor of Rome had closed the city’s schools for today (and tomorrow). I myself made a good faith effort to get to my class. I left earlier than usual; but, by the time I got to the bus stop, my feet were already soaked and I had almost slipped several times. The traffic was completely snarled. It would have taken at least twice as long – or longer – than normal to get to class. And my anxiety about walking up the Janiculum Hill – and even worse walking back down in the dark and then hoping to catch a bus home – finally persuaded me to give up and go home. This evening, I ventured out to go to church to get my throat blessed. Treading carefully through the icy slush, I saw several Romans - all adults - thoroughly enjoying themselves making and throwing snowballs at each other. I have always loved snow, which I frankly consider one of the most beautiful of God’s creations. I hate driving in snow (but then, of course, I hate driving, period!) The fact that snow impedes us from carrying out some of our ordinary activities may be a good reminder that winter was intended to slow us down and stop some of those ordinary activities. It’s not winter’s fault if our modern, industrialized economy needs to continue at the same consistently frantic pace all year round. Winter is just being winter! Rome’s several hundred churches are justly famous for their history, for the saints whose relics are venerated there, and for their artistic treasures that draw admirers from all over. 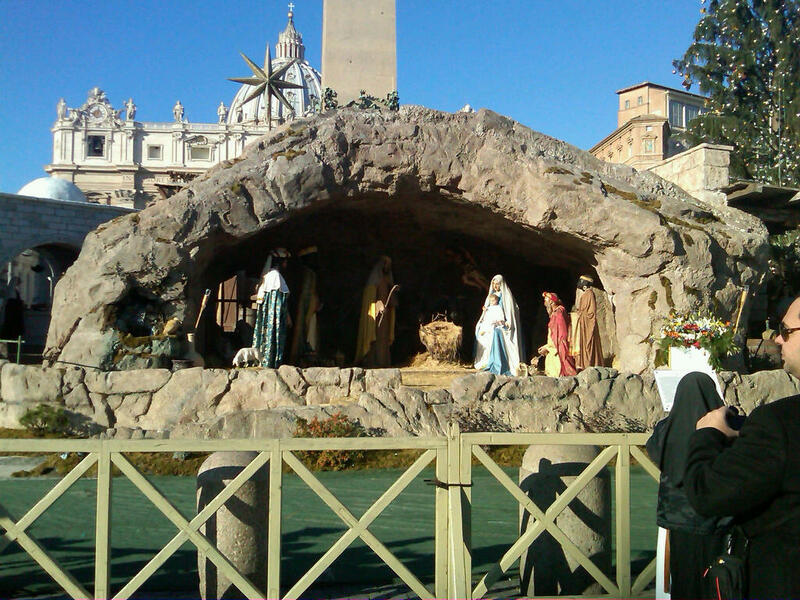 Additionally, during the Christmas season, each church features its own distinctive presepio (nativity scene) – often comparable artistically to the mosaics, paintings, frescoes, and sculptures that surround them. Not just tourists but regular Romans visit the different churches during this season to admire them. But, with the feast of the Presentation of the Lord on this the 40th day of Christmas, the Christmas season finally comes to an end, and the presepe disappear for another year. This is a very ancient feast, which incorporates several interrelated themes, reflected in the different names given to this day. All these different names illustrate how full of meaning this festival is, and how much it has to teach us. In the Western Church, today is currently called officially the Presentation of the Lord; but for several centuries it was the Purification of the Blessed Virgin Mary. When Jesus was 40 days old, Mary and Joseph journeyed to Jerusalem according to the law of Moses (see Luke 2:22-40), that is to say, in obedience to God’s law, in order to observe two important religious obligations. The first - the ordinary obligation to be purified after childbirth - reflected ancient beliefs about the sacredness of blood. Life was believed to reside in the blood, which was, therefore, something sacred and mysterious. Hence, any direct contact with blood required ritual purification. The second concerned the special status and religious responsibilities of a first-born son (because of God’s having spared Israel’s 1st-born at the time of the Exodus). Jesus, Mary, and Joseph’s participation in these rituals invests them with a universal significance – highlighting for us, first, the inviolable sacredness of all human life, and, second, the special status (and corresponding responsibilities) which now define our entire lives as adopted sons and daughters of God the Father, because of our identification with his Son’s life, death, and resurrection. Whether officially titled the Presentation of the Lord of the Purification of the Blessed Virgin Mary, however, the most common popular title for today’s celebration in the West has consistently been Candlemas Day, because of the Blessing of Candles and the Procession - originally in Rome an early pre-dawn procession – with which today’s Mass begins. The name Candlemas calls attention, obviously, to the blessed candles, but also to their light – and to the One whom that light symbolizes. The Church’s official ceremonial books says that “on this day Christ’s faithful people, with candles in their hands, go out to meet the Lord and to acclaim him with Simeon, who recognized Christ as ‘a light to reveal God to the nations. They should therefore be taught to walk as children of the light in their entire way of life, because they have a duty to show the light of Christ to all by acting in the works that they do as lighted lamps” (Ceremonial of Bishops, Part IV, chapter 2). A secular version of Candlemas is “Groundhog Day.” Not so long ago, everyone in the western world knew about Candlemas Day. Today, many people – even some Catholics seem to have forgotten. Yet even people who have never heard of Candlemas recognize the folklore connected with this day and connect it with the change of seasons. While the weather is still wintry, the days are noticeably getting longer. Whereas Christmas comes at the mid-point of the winter’s darkness, with the year’s shortest day and its correspondingly longest night, Candlemas comes at the mid-point between the winter solstice and the spring equinox, the transition (according to one traditional way of reckoning the seasons) from winter to spring. Soon, day and night, light and dark will be equal. So this last of the winter light festivals invites us to look ahead to what these winter light festivals are meant to symbolize. Today we recall with joy the Lord’s entry into his Temple: and suddenly there will come to the temple the Lord whom you seek (Malachi 3:1-4). At the same time, we hear, in wise old Simeon’s words to Mary, the first reference to what lies ahead, the first reference to the cross. Behold, this child is destined … to be a sign that will be contradicted – and you yourself a sword will pierce – so that the thoughts of many hearts may be revealed. So, even as we take a last look back at winter and Christmas, Candlemas looks ahead to spring and to Lent, and reminds us that the point of Christmas is Easter. Simeon and Anna’s encounter with the infant Jesus in the Jerusalem Temple points us toward our own encounter with the Risen Christ here and now. In the Eastern Churches, this day is appropriately called the Encounter, the Feast of Meeting. Today, Christ comes to meet us, and we in turn get to meet him. 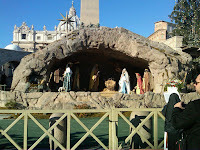 Every Christmas we encounter Christ in a special way in the image the infant Jesus in the manger. When we encounter the infant Jesus in the nativity scene in church and at home, we appreciate anew the great mystery of the incarnation of God’s Son. When Simeon and Anna experienced in the infant Jesus the human face of God, they spoke about the child to all who were awaiting the redemption of Jerusalem. They hastened to proclaim & share their good news. That remains our task today – to take the light of those candles out into our spiritually still so very dark world, and so to share with all the light reflected in our own lives from the brightness of the human face of God.